The Lamy Special Edition cartridge fountain pen ink has been created to match the Lamy Special Edition Al-star and Safari fountain pens. This ink have been created in limited quantities and will only be available for a short time. The 2019 Special Edition ink color is bronze, estimated to arrive in March. 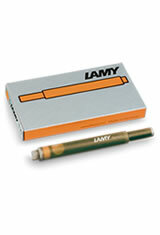 The Lamy Special Edition Cartridge(5pk) Fountain Pen Ink usually ships within 1 business day unless otherwise specified. Each Lamy Special Edition Cartridge(5pk) Fountain Pen Ink we sell is guaranteed to be genuine, authentic and will arrive brand new & unused! I love the new color and I love Lamy pens in general and their inks go well as a complement. This is a great ink color, and the quality of the ink itself is excellent! I am happy that I bought several boxes of this ink. Haven't found a use for these yet. They are VERY pink!